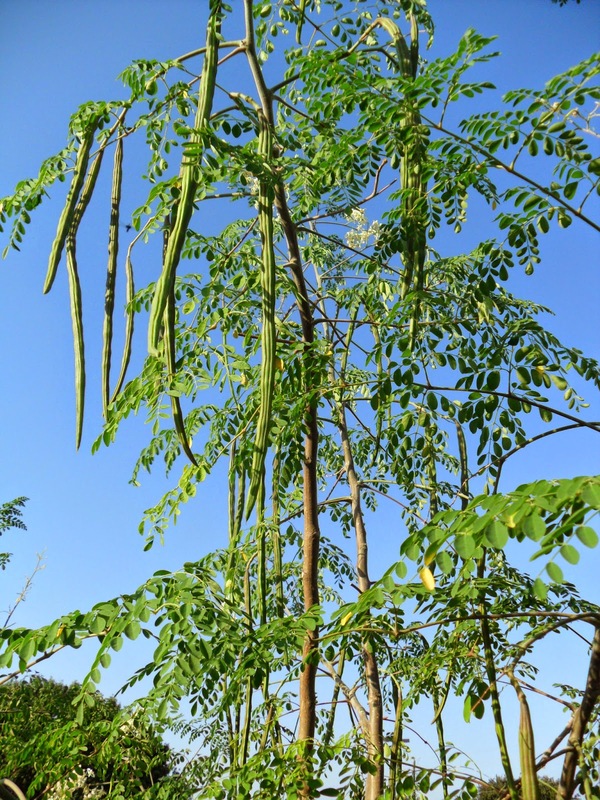 Moringa oleifera the scientific name of the drumstick tree is a tree with a million uses. Originally from the Indian sub continent. All parts of the plant are edible, the leaves being exceptionally nutritious. The leaflets are stripped off the leaf and can be eaten raw in salads or cooked, steamed or stir fried. The Moringa seeds yield 28-40% edible oil. The flowers are also eaten. The roots can be harvested to prepare a condiment with a horseradish taste, however, the root bark should be stripped off and not too much eaten. Moringa is one of the most powerful health-enhancing plants. While many things found in Nature can have one or two health benefits, Moringa has many. India’s ancient tradition of Ayurveda medicine sites 300 diseases that are treated with the leaves of the Moringa tree. Recent scientific research has proven that these humble leaves are in fact a powerhouse of nutritional value. Horseradish tree, also called drumstick tree, (Moringa oleifera), small, deciduous tree, of the family Moringaceae, native to tropical Asia but also naturalized in Africa and tropical America. Horseradish trees can reach a height of about 9 meters (30 feet); they have corky gray bark, much-divided, fernlike leaves, and scented clusters of white pea-like flowers. The angled dagger-like fruits sometimes grow to 45 cm (18 inches) long. Flowers, pods, leaves, and even twigs are cooked and eaten. Sunlight: The Moringa tree requires full sunlight, i.e. direct exposure to the sun for around 6-8 hours a day. Water: It is actually a drought resistant tree, and only needs to be watered sparingly, once the soil has completely dried out. Sowing Season: As it is a warm season plant, the drumstick tree is usually planted after the end of the cool season. Sowing Method: The seeds should be planted in an area with light, dry soil, and placed in holes dug 30cm (1ft) deep and 30cm wide. The holes can be filled in with loose soil, and/or compost or manure to help the tree grow. In each hole plant 3-5 seeds at a distance of 5cm (2in) apart, and water the soil, such that the top soil remains moist. The plant will germinate within 12 days. Care: When the saplings grow to around 15cm (6in) tall, then in each plot, keep the healthiest one, and pull out the rest, as they can be susceptible to various pests. A layer of compost or manure should be applied to the soil, to promote growth. Take care not to over-water your plants, as the soil should be kept dry so as not to choke the roots. Pests: Some common pests are termites and nematodes, which generally infest when the tree is in its sapling stage. This can be prevented by spraying an insecticide or by regular inspection and crop rotation. Harvest: Generally the plants flower and bear fruit either once or twice a year. In South India, the plant is known to give fruit once in July-September, and again in April-May. In the first year of the plant, the yield is usually around 150 pods, which keeps increasing as the years go on. After 4-5 years, the tree usually yields around 1000 pods. Propagation: The drumstick tree can be propagated by seeds, or by cuttings. In the latter, the branches of an existing tree are cut and then placed on the ground. The size of the branches should be around 1m long, and 4cm in diameter. It should be completely planted underground and watered regularly. The yield from the cutting method of propagation is just as much from seeds and is also common due to the relative ease of planting the cuttings, as compared to seeds. Moringa leaf contains iron, anti-inflammatory, and antiseptic properties. This helps to cure minor injuries like bruises, cuts, and burns. It also helps in quick healing of injuries. Moringa leaves are a powerhouse of nutrients. The leaves of drumstick tree have diverse range of health benefits. The leaves of this tree are packed with nutrients. The leaves of drumstick are an excellent source of Vitamin B, Vitamin C, and provitamin A, vitamin K, beta-carotene, vitamin K protein and manganese aside from other major essential nutrients. In many Asian countries, women consume Drumstick leaves for healthy glowing skin and hair strengthening. 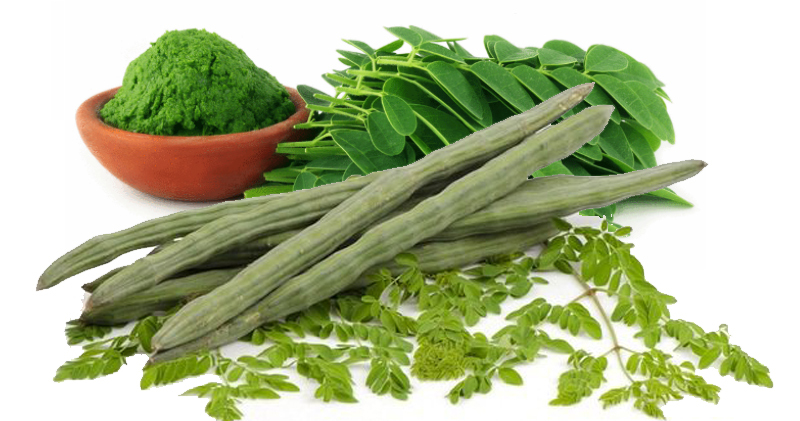 Also, Moringa leaves have natural blood-purifying properties thereby helping in acne reduction. Drumstick leaves are a good source of B-complex vitamins such as folic acid, pyridoxine, and riboflavin. These play a vital role food digestion. The vitamins present in drumstick leaves are known to regulate the digestive process by aiding the breakdown of complex fats, proteins, and carbohydrates. People taking Moringa leaf extract and leaf powder often report weight loss. This beneficial effect could be due to many factors. The anti-inflammatory and diuretic effect helps reduce water retention. The high fiber content reduces fat absorption in the gut. The reduction in insulin resistance may prevent excess fat accumulation. Fresh moringa (drumstick) pods and leaves are an excellent sources of vitamin-C. 100 g of pods contain 145 µg or 235% of daily required levels of vitamin-C. 100 g of greens provide 51.7 µg or 86% of daily-recommended intake values of this vitamin. Research studies have shown that consumption of fruits/vegetables rich in vitamin C helps the body develop immunity to combat infectious agents, and scavenge harmful oxygen-free radicals from the body. Due to its anti-inflammatory property, pods are traditionally used to treat stomach ulcers. Seeds are rich in Vitamin C, and therefore it finds its application in the form of soup to treat cold and flu. It is a good source of iron, vitamins, and calcium and thus helps us to have strong and healthy bones. Pregnant women are recommended to use green pods as a soup or juice to avoid post-delivery problems. Due to its anti-bacterial qualities, it is also helpful in dealing with throat, skin and chest infection. The anti-cancer arsenal of moringa is impressive. Besides antioxidant vitamins A, C, and E, it contains kaempferol, quercetin, and rhamnetin. Since cancerous growths are triggered by free radical damage at the cellular level, it is not surprising that Moringa should have an anti-cancer effect. Lab tests have proven that it has a beneficial action against liver, lung, ovarian and skin cancers. Extracts of Moringa flowers are used in herbal creams to reduce inflammation and soothe sore muscles. Moringa flower extracts are also used to make perfumes and hair oils. The aromatic flowers are used in aromatherapy sessions at spas. In many cultures, Moringa flowers are brewed to make a medicinal tea decoction or consumed as a health tonic to treat urinary tract infections. Because of its high nutritional value, vegetables made with flowers of moringa are consumed by breastfeeding women to increase milk flow. Moringa flowers are also recommended in weight loss diets because of the presence of a powerful diuretic that helps reduce water retention and bloating. Furthermore, individuals that are required to take antibiotics and painkillers as medication and treatment should consume moringa flowers as a vegetable as it protects against tissue damage caused by prescription drugs. Moringa flowers are also used as an alternative treatment for sexual dysfunctions, low libido, lack of sexual urge, and impotence. In many Asian countries, men like to consume drumsticks as it is known to enhance sexual pleasure. Juice of Drum stick when mixed in milk and offered to children greatly helps by strengthening their bones as it is said to be a great source of Calcium. Also, the drumstick is said to be a great blood purifier. Drumstick soup helps ease any kind of chest congestions, coughs, and sore throats. Finally, drumstick juice greatly adds to the glow on one’s face. Make a mixture of drumstick and lime juice and dab it on your face. You will find your face glowing greatly. general. Both these types of pests contribute to severe losses from time to time. Insect leaf-herbivory is the most common issue for Moringa in most countries. Herbivory affects the quantity and quality of the leaves. Leaf caterpillar or Leaf worm Noorda blitealis W. (Crambidae: Lepidoptera). in the drying of the leaves into a papery structure. Itch worm/caterpillar, Euproctis pasteopa Collenette(Lymantriidae: Lepidoptera). This is a major pest of Moringa in Ethiopia. The larvae feed on young leaves (especially on leaflets) in a thin silken web on the lower surface . They generally pupate in the soil although pupation could also occur inside cracked and matured pods of Moringa In the mixed cropping system, maximum defoliation is observed during the main rainy season in July, reducing leaf biomass production by 31-70 percent; in the mono-cropping system, leaf biomass production can be reduced by more than 75 percent from July to December. Hairy caterpillar, Streblote siva Lefebvre (=Taragamasiva) (Lasiocampidae: Lepidoptera). Leaf-eating caterpillar, Ulopeza phaeothoracica Hampson(Crambidae: Lepidoptera). This species has been reported as a serious leaf feeder of Moringa in Kano State in Nigeria . The larvae feed on leaf lamina turning it into transparent parchment-like structures. Heavy infestation occurs between July and September. Pupation takes place inside a silken cocoon and the adult emerges in about eight days. These groups of insects are known to cause direct damage bydraining the plant sap, and could possibly be the vectors of virus diseases. Plant lice, Aphis craccivora Koch. (Aphididae: Hemiptera). malathion. It is known to feed on a wide range of host plants. Whiteflies, Bemisia moringae, and Castor whitefly, Trialeurodes ricini Misra(Aleyrodidae: Hemiptera). Both of these species have beenobserved sporadically on Moringa by many researchers. In this category, most serious are the budworm and pod fly. The bud midge could become a problem in some months and locations. Budworm, Noorda moringae Tams. (Crambidae:Lepidoptera).